I recently tried my hand at baking cookies, and so I finally decided to give my favourite cookies a shot. Raisin oatmeal cookies! I used to just buy store-bought cookies (ie Famous Amos) but a colleague told me a horror story of how she saw a worker carrying a shipment of those cookies dropped a box in a dirty alley behind the store… and then scooped them back into the box and carried them in. So now if I want cookies, I’ll make them myself dammit. They turned out beautifully, too, if I don’t say so myself 😉 It’s an easy recipe, I hope you’ll give it a shot. These are REALLY good cookies! Preheat oven to 350 degrees F (177 degrees C) and line two baking sheets with parchment paper. In the bowl of your electric mixer, beat the butter and sugar until creamy and smooth. In a separate bowl, whisk together the flour, baking soda, salt, and ground cinnamon. Add the flour mixture to the creamed mixture and beat until incorporated. Stir in the nuts, oats, and dried cranberries or chocolate chips. For large cookies, use 1/4 cup of batter and space the cookies about 2 inches (5 cm) apart on the baking sheet. 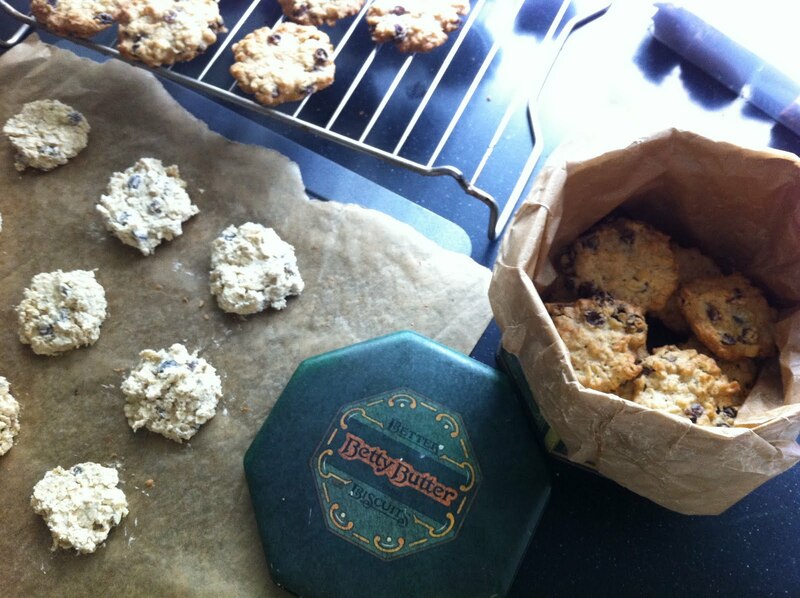 Then wet your hand and flatten the cookies slightly with your fingers so they are about 1/2 inch (1.25 cm) thick. Bake the cookies for about 12 -15 minutes or until light golden brown around the edges but still soft and a little wet in the centers. Remove from oven and let the cookies cool a few minutes on the baking sheet before transferring them to a wire rack to cool. To toast nuts: Place nuts on a baking sheet and bake for 8-10 minutes or until lightly browned and fragrant. Let cool and then chop into pieces. For presentation purposes, I thank the fact that my mother loves to collect pretty little antique tins. The one I used in the picture above (wow, I really should start taking better pictures) was acquired a good 20 years ago at a car boot sale in Nottingham. The tin itself it a Betty Butter biscuit tin from 1890. Pretty pretty.